Here is where you'll find some fun Dia de los Muertos art for sale at great discounts and projects for yourself and the whole family. You may be asking, "What the heck is celebrated during Dia de los Muertos, anyway?" It's a special holiday to celebrate loved ones that have passed away. The Day of the Dead falls on November 1st and 2nd and during these days family members of the deceased pay homage to their loved ones. Find Dia de los Muertos Jewelry for sale. It's another way to honor their spirit and especially popular in Latin American countries like Mexico. If you happen to be in Guadalajara, Mexico during this time you'll want to visit the famous Panteon de Belen cemetery for their famous night tours and to catch it decorated for the holiday. 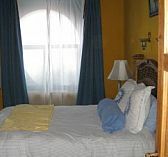 Many people believe it is haunted. Also check out some pictures of the Panteon Guadalajara, no ghost sightings as of yet but we are keeping a look out. 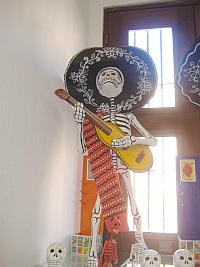 If you haven't noticed already, much of the Dia de los Muertos art that you'll see is usually very humorous. You might see a paper mache skeleton dressed as a bride or groom or skeletons dressed up in everyday attire and wearing brightly colored clothes. They might also be doing something funny like this one to the right. They are meant to be silly, fun and make light of the somber topic of death and hopefully remove the fear of the grim reaper, especially for young children and adults too. Find out how to make my favorite project, cute marble magnets. After all, we all die someday right? So we might as well laugh about it. 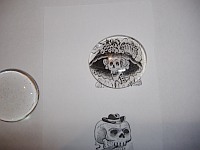 Find some Skeleton pictures or Dia de los Muertos art clips that you like and print them out on cardstock. Make sure they are no larger than 1" x 1" to be able to fit your marble. Take one of your pictures and squeeze a dime sized dollop of glue directly onto the picture you want to use. It is slightly amber colored but don't worry because it dries clear. Pick out one of your clearest marbles, the less bubbles and flaws the better, so you can see your picture clearly. 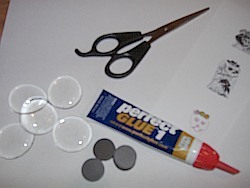 Press your marble directly onto the glue and smoosh it down so the glue spreads evenly and outward to the sides. 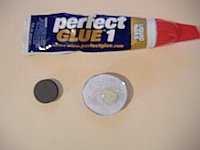 Make sure you press out any air bubbles created by the glue. It is okay if some of your glue comes outside of the marble because you'll cut this off later. Let it dry for several hours, I usually let mine dry overnight. Next, you will cut out the shape of the marble making sure none of your paper is sticking out and you'll also be removing any glue that is showing. Lastly, you will turn the magnet over and put another dime sized dollop on the back and press your magnet down into the glue. Let the marble dry face up (magnet will be on bottom) where it won't be disturbed and it should be ready to hang up after a day. And then you're done. If you want to use a photo of someone, don't use the original on photo paper, it will react funny with the glue and look a little strange. You will need to make a color copy of your picture on regular paper and then work away. This can be done with just about anything you want to keep forever and they make great personalized gifts to friends and family members. These popular sugar skulls are great treats to give away or to place on your altar honoring your loved one! They are surprisingly easy to make and fun to decorate. The best part is eating them. Use 2 cups of sugar and add 2 teaspoons of meringue powder. Add 1 teaspoon of water per cup of sugar and mix. The mixture should be damp enough to mold to your hand when you squeeze it, if it crumbles you probably need to add a little more water- but not too much. Pack the sugar tightly into your mold and then invert onto a cookie sheet to dry out. Decorate as desired. This is a really fun project to do with children. This necklace is made from polymer clay. You can find the clay at any hobby shop. I chose white to go with my skull theme. I simply rolled a small piece into a ball and started shaping the ball into a tiny skull using my index finger. You could also make it larger if you'd like and use it as a keychain. I inserted a jewelry pin into the clay and then baked at 250 degrees for about 10 minutes. Baking directions are shown on the package (depending on what type you buy). When it was done I then painted the face with a tiny paintbrush or just use a black pen. I added the black rope and finished. Do you want to make those popular Day of the Dead artsy sugar skulls but want them to last forever? 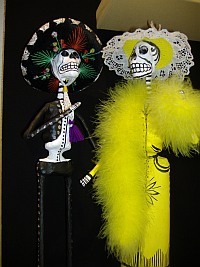 Here's an easy way to have your Dia de los Muertos art project last for years to come- no sugar needed. This is a really easy art project to help bring out your creative side. Follow the directions on the Plaster of Paris container then pour into the skull mold. Be sure to put your mold on something that will hold it up so it can dry evenly. I use a bowl and sit the mold inside it. Once you have poured the plaster be sure to tap the mold many times to make sure you get rid of as many air bubbles as possible. Let it dry, I usually put too much water in mine so it takes several days to dry. When your plaster skull is completely dry paint, add flowers.. be creative! Then display.